It probably comes as no surprise that 81 percent of businesses are using or are planning to use the cloud for mission-critical apps within the next two years. But while cloud has hit the mainstream, remember this: not every application will be suitable for it. In particular, legacy or in-house developed applications are often not viable candidates for the cloud. These apps are typically more complex than an organization’s non-legacy counterparts. They may also have critical local dependencies and rely on legacy protocols or operating systems that are not even available or supported by cloud providers. Even if deemed technically possible to migrate, without understanding the ramifications of such a move on the performance, end-user experience, and costs to the business, such a move could be disastrous. Of course, this doesn’t mean all is lost if you are considering moving a legacy application to the cloud. To minimize the risks and ensure migration success, follow the three guidelines outlined in this post (and be sure to download our free white paper for a more in-depth look at this topic). This one is pretty straightforward: are the costs of making the required code or architectural changes to render the legacy app ‘cloud ready’ less than the costs of maintaining it on-premises? If the true costs of migrating the legacy app to the cloud compare favorably to maintaining it on-premises, completing a cloud migration readiness study will allow you to better understand the business and technical factors. Should the readiness assessment help you determine that a legacy application is a suitable candidate for the cloud, complete a study focusing on pre- and post-migration performance for critical transactions. Bandwidth requirements: Moving workloads to the cloud can eat up a ton of bandwidth. In some cases, you may find that you need bigger links. Critical dependencies and traffic volumes: Collect detailed network traffic to gain volumetric information regarding user access to the application. You can also introduce application dependency mapping software to discover and highlight the legacy application’s critical dependencies. End-user experience: Baseline existing performance levels for key business transactions to understand the performance impact and the effects on the end-user experience. Next, run a post-migration study in a similar fashion to ensure that performance SLAs are maintained after the move. As your organization plans and executes on your enterprise-wide cloud adoption strategies, prevailing challenges will arise around which applications to move, virtualize, replace, or leave as is. 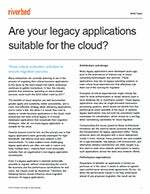 To help you determine which of your legacy applications are suitable candidates for the cloud, we invite you again to download our white paper that expands on the topics presented within this post. And as you assess these applications as part of your overall business strategy, keep in mind that the Riverbed Application Performance Platform™ and Riverbed Professional Services can help you prepare for cloud migrations.